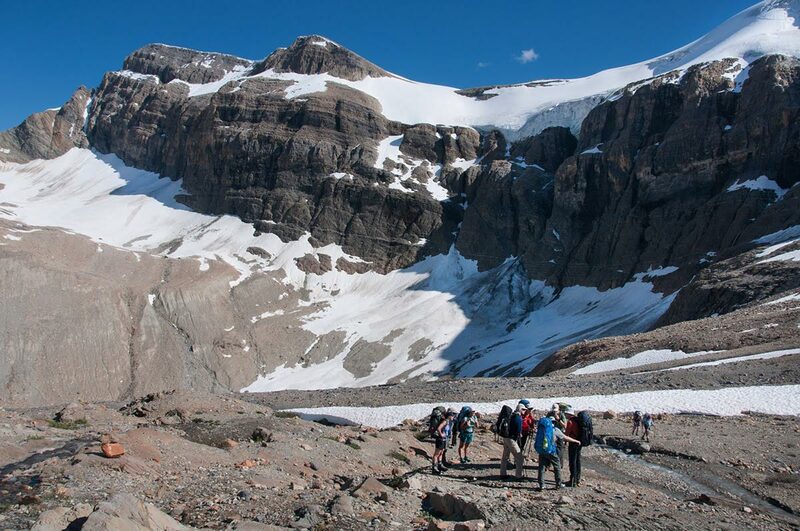 If the summer heat is getting you down, there’s one surefire way to cool off: hike a Canadian glacier. The Wapta Icefields stretch far across the Canadian Rockies in Banff National Park, just north of Lake Louise, and this moderately challenging three-day course is a perfect way for thrillseeking hikers to see them. You’ll start by hiking up the Bow Glacier, being led by expert guides who can explain the rugged frozen ecology intimately and comfortably. You’ll see extraordinary peaks while trekking in secure crampons along the paths to Peyto Hut, Mt. St. Nick and Peyto Lake, and feast on wild trail cuisine, custom prepared by the crew. Drink fresh glacier water from the streams before tucking in for the evening in alpine huts operated by the Alpine Club of Canada, waking up each morning to the incomparable sunrises of the Rocky Mountains. Day 1: Hike for roughly four hours across seven kilometres from Bow Lake to Bow Hut, starting along a popular trail and moving onward to a steeper route that rewards travellers with views of a stunning limestone gorge. Finish the day near the Bow Glacier with a clear view of the starry night sky, 2,350 metres above sea level. Day 2: Wake up early to trek across the Wapta Icefields toward Peyto Hut, across limitless mountain peaks, ice floors and panoramic views. Tread carefully and slowly with an experienced guide across six kilometres—and enjoy the view from every moment. Day 3: Descend back down from the glacier, passing old moraines and a glacier research station, along flowing rivers until you reach Peyto Lake. From there, you’ll return to the well-beaten path and trek back to relax in Canmore. Length/Departs: 3 days / July-Sept.